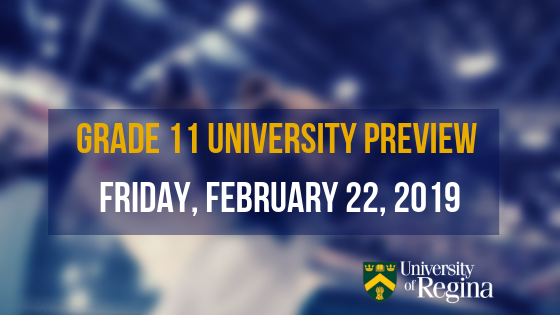 We are excited to see you at the Grade 11 University Preview! Once you have read all of the relevant information, please make sure to sign up for the sessions you would like to attend. Sign up quick before the sessions reach capacity! 3:00 - Break for snacks! What are my parking options once I get to the event? I live out of town, are there options to stay in on-campus housing? Yes, students attending this event are welcome to stay for FREE at Luther Residence or pay $42/night to stay at U of R Housing! If you do not have a chaperone available, we will provide a waiver for your parent/guardian to fill out. Please visit the link above. If you are participating in yoga, please bring appropriate attire. Again, please make sure you register for your sessions. Please sign up for your specific sessions through this link. You will need to choose two (2) of the break-out sessions to attend. Title: What does it mean to be in Education? Description: Do you want to be a teacher? Not quite sure? This session will introduce you to the Faculty of Education, its programs, and its inclusive philosophies. Join us as we map out what a future in education might look like! Description: Compete for prizes as you show off your knowledge of French culture, food and geography in this bilingual, Jeopardy-style trivia game (no prior French experience is required). Title: Simulation Manikins: Help Me!! Description: Nursing is a fascinating and rewarding career! Come try your hand at the Simulation Lab where you will work in pairs to tackle a complex acute care patient. You and your partner will have the opportunity to see what the nursing program has to offer through the use of simulation technology, medical equipment, virtual tools, and hands-on patient health assessments. **Warning to those students who get queasy easily! Description: Waves can be seen in many different media – from mechanical type waves to sound and light. The physics of waves will be explored through a series of interesting demonstrations! Title: What does it mean to be in Pre-Professional Studies? Description: Pre-Law, Pre-Dent, Pre-Med, Pre-Pharm, Pre-Opt, etc. –what does it all mean? Have your questions answered by two of our advisors. Description: Cross-training with yoga can help you gain strength, flexibility, and stamina to improve your performance in other sports. Designed for all level and abilities, this yoga class is the perfect addition to any dryland training program. ** Make sure you bring/wear comfortable clothes! No shoes are allowed in the studio. Description: There are 400 universities in over 50 countries around the world that you can study at while working towards a U of R degree! Come to this session to hear more about those options. Please choose your sessions at this link.